Over the past five weeks I've worked in a year 4 class full time. One of the things that is ongoing learning for me is the way learning and teaching is organised. Not just for my own sanity but so students feel like they have some control over their own learning. One of the ways I do this is to have a digital home. I find it useful for organising learning and attempted to implement this into the class I worked with. 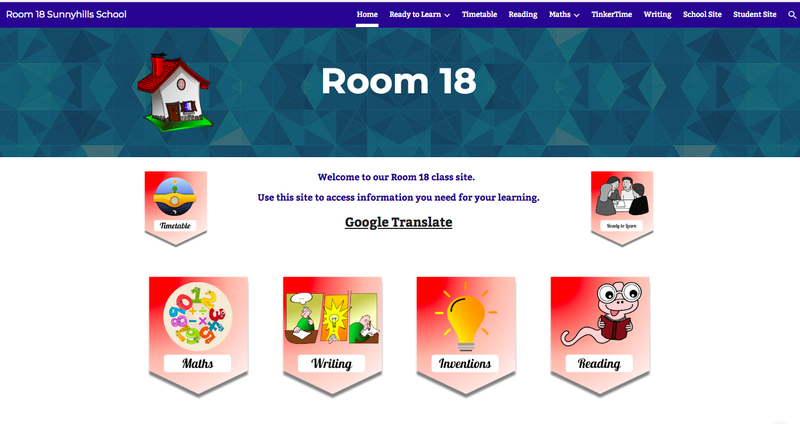 While classroom blogs are great for this, I find a classroom site especially one built with the new Google Sites or similar easy to use platforms the best option. The students were very used to using websites and were fairly happy to navigate the one I created for them. 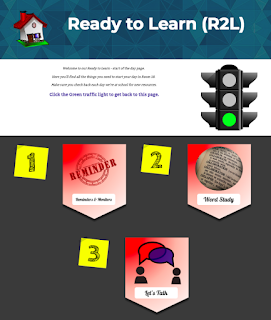 I used the site to display our morning work, reminders, literacy and numeracy activities as well as our Tinker time choices and links to our class blog, school site and any other collaborations we happened to be working on. The buttons on the homepage or entry point for the site were links to those pages we accessed everyday and provided a more visual reference for those students that found navigating by words alone difficult. 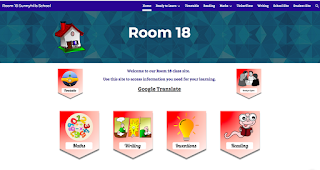 We had a group of international students visiting the classroom so a link to Google Translate for them and for the students helping them in the classroom proved really useful. This page also included links to the timetable and ready to learn pages of the site. Those students that wanted to look ahead at what was happening in the week found having access to the timetable great. Although with the inevitable changes in a normal school week this wasn't always the most up to date. So the timetable site came with a bit of a disclaimer in the last few weeks that it wasn't always the most up to date. At this point in time I still find it easier to have a printed copy of planning to cross out, jot down group notes and make changes to rather than on the digital copy... I'm working on a digital solution for this though to ensure students also get access to that information. I've yet to find a setup that I like more than pen and paper but watch this space :). I think if I design another site I'll add the buttons to the top of every page as they were really useful for students that found picture navigation easier than using the top menu navigation. The ready to learn page was the students first point of call and the one they jumped onto as soon as they entered the classroom in the morning. This included links to our class and team reminders, our monitors for the day and the start of day activities - Word study, Let's talk, Singing & Wondering. 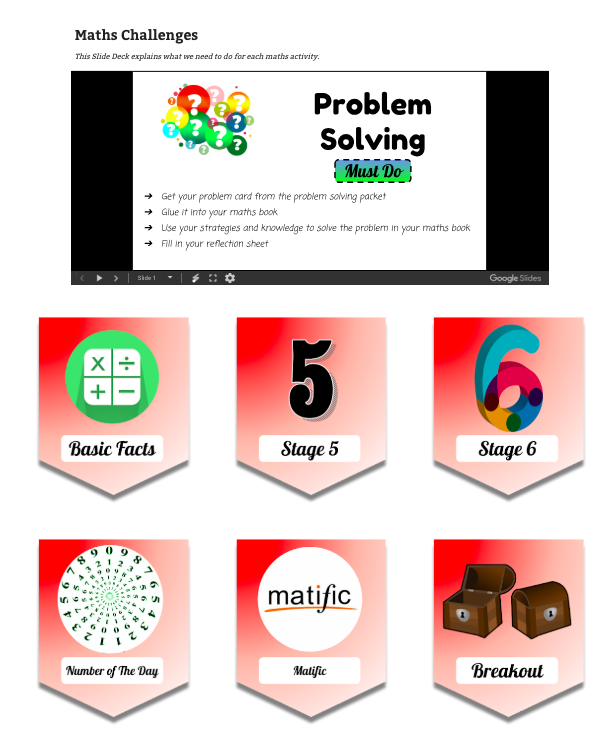 The page also included links to get to our Grid Pals (Flip Grid class connection) grid and to get to anything that was specific to that week - like maths week. This part of the site was our oral language activities, students really enjoyed the difference to their traditional news book and it allowed a bit of variety in what we were talking about each morning. It also made it really easy to take advantage of news stories that weren't printed outside of school so things like our soft plastics recycling launch. 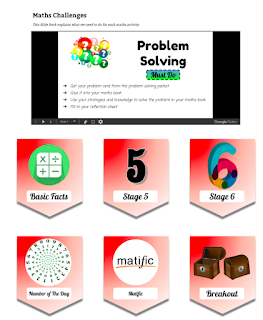 I started implementing screencasts that read the days topic to students. I used Screencastify to do this. This meant students didn't need to rely on me to read the questions to them and allowed our internationals to listen and read English at the same time. 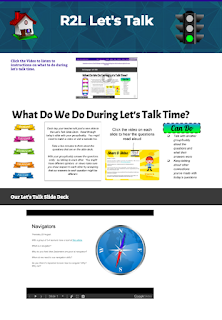 The what do we do during let's talk time was added a few weeks into the piece, this kind of image was also added to the literacy and numeracy pages as I felt I was repeating similar instructions each day to ensure everyone was on the same page. It was much better to direct students to the page and the image explaining what they needed to do. It still needs refining but it worked for us. I also added a video that explained how to get to each days Lets talk activity. The majority of students in the class didn't need any explanation for what to do but it was helpful to have this for our international students and those that needed a bit of extra support. I really love using google classroom but found it quite difficult for students to navigate as another place to go to find work, so I used the class site to link directly to the assignments they needed. If we had a literacy assignment to complete they could click on the button on the site and go directly to that assignment in Google classroom. Click the 3 dot menu at the top right of the assignment while you're in the stream and select 'copy link to assignment'. Add the link to your class site or wherever you want students to access it. I then use the link on the class site - usually in the form of a button the students can click on. 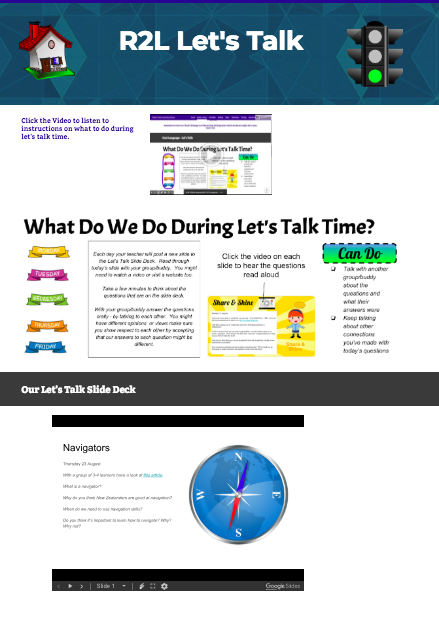 Literacy and numeracy followed very similar lines to the Lets Talk page. Each page had a heading with what do we do during..? and then gave a brief explanation of what students needed to do each day. I separated out writing and reading to limit the amount of scrolling children needed to do but the headings at the top were both 'what do we do during literacy time'. I did this to keep the link between reading and writing for students and not have the two areas completely separate. Each activity for these areas required a bit more explanation so that was added in the form of a slide deck and next to links/buttons if required. The activities/challenges related to what students were currently learning as well as revising what they'd previously learnt. Most of the students were able to chose an appropriate challenge themselves. A few required a little extra help getting started. Each student also had a reflection to do each day. This was linked using a button to a Google Classroom assignment. Students used the same document for the whole five weeks to keep track of their reflections. This was a means of tracking what they were doing and allowed me to then make connections with them if I didn't get to during class time using comments on the documents themselves or private comments via Google Classroom. If I did it again I'd probably change the format a little to give more guidance at the start with what questions to answer for their reflection and give the students more scaffolding about why we're doing the reflection. Having a digital home proved to be really useful for the students and definitely gave some students a chance to manage their own learning. It was by no means a perfect site and I would probably organise it a little better next time. However the comments from students and parents proved having this available 24/7 gave them a much better insight into how things worked in the classroom and the opportunity to continue their learning where-ever they were. Students liked being able to see what was happening and were always quick to talk to me if I'd forgotten to add something, they had a question about what was going on during the week or if there was an error in the site. It's well worth giving it a go!